Nebraska football held its second open practice of the fall on Wednesday and the Hail Varsity staff was on hand for the first 30 minutes to see some warm-up drills and some position-specific action. Erin Sorensen, Greg Smith, Jacob Padilla and Derek Peterson offer up some thoughts on what they saw. >> Wideout Bryan Reimers and offensive lineman Jalin Barnett were the only two Huskers not in pads with the team on Wednesday. Running back Wyatt Mazour had a green no-contact jersey on. >> Recent UCF transfer safety Tre Neal is going to wear No. 8 for the defense this season. >> Miles Jones was not working last week when the media observed practice. He was on Wednesday. Jones was going through drills with the wideouts despite wearing a running back number (26) and bigger pads you typically see on backs and not wideouts. 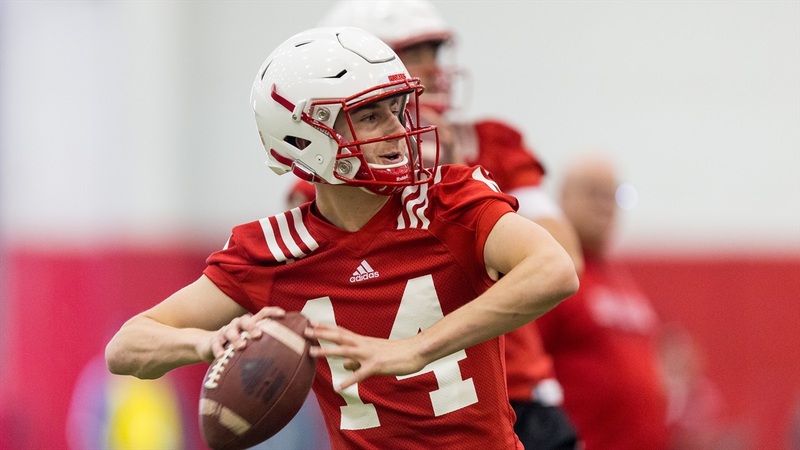 >> When the offense walked through plays (walked being used loosely here), there was a noticeable difference in the tempo with Adrian Martinez running the show compared to Tristan Gebbia and Andrew Bunch. Martinez's unit was running through plays at the fastest rate in part because the coaching staff was clapping and yelling and pushing things to move as quickly as possible. In recent weeks, coach Scott Frost has talked about a desire to get Martinez playing faster. That much was evident on the field. Not so much with Bunch though, who immediately followed Martinez. There was a noticeable difference. Gebbia, who ran the offense first, was in between. >> If you want to put any stock at all in position groups from the defense, what looked like the ones were as follows: Mick Stoltenberg, Freedom Akinmoladun and Ben Stille on the line, Tyrin Ferguson, Mohamed Barry, Dedrick Young II and Alex Davis at linebacker, Lamar Jackson and Dicaprio Bootle at corner and Deontai Williams and Antonio Reed at safety. Luke Gifford wasn't involved for any of the plays I witnessed on defense. Maybe it was a light day for him. The coaching staff has said they're handling his return with some caution. >> Tre Bryant was also limiting his reps and was conditioning off to the side when not taking reps.
>> A Los Angeles Chargers representative was at practice. >> The music played ranged from "It Ain't My Fault" by Brothers Osborne to "I Like It" by Cardi B, Bad Bunny and J Balvin. >> Defensive coordinator Erik Chinander stopped the linebackers during a drill to tell them his expectations. He wants them to "want it" more than the other team, and he expects them to fully attack drills like it's a game situation. >> Seeing Freedom Akinmoladun working during drills in pads really confirmed that he has slimmed back down. He’s listed at 295 but is carrying it well. Now the hope will be he regains some of that explosiveness that allowed him to burst onto the scene in the first place. >> Last week, tight ends coach Sean Beckton said that freshman tight end Cameron Jurgens was about 95-percent recovered. Jurgens was getting work today and looked good. He made a nice over the shoulder catch on a corner route. >> There was a lot of talk about the pace of practice during the spring and rightfully so. The players hustle from station to station without a lot of rest in between periods. Something that stood out to me today was that coaches are also hustling around and keeping guys fired up. Everyone’s on the same page there. >> Jerald Foster and Tanner Farmer were snapping with the centers during one warm-up drill (five centers to go with five QBs). Cole Conrad, Will Farniok and Hunter Miller were the others. There wasn't any apparent matching with quarterbacks. >> Scott Frost hopped into one of the warm-up passing/receiving drills and was dropping some dimes. >> Foster and Stoltenberg were again leading the team before stretch. Stoltenberg got guys particularly hyped up and the team was ready to go before any coach stepped in. >> The first offensive line unit during walk-throughs: Brenden Jaimes (left tackle) Foster (left guard), Conrad (center), Farmer (right guard) and Matt Farniok (right tackle). The second unit: Christian Gaylord (left tackle), John Raridon (left guard), Hunter Miller (center), Boe Wilson (right guard), and Matt Sichterman (right tackle). Third unit: Trent Hixson (left tackle), Broc Bando (left guard), Will Farniok (center), Collin Shefke (right guard) and A.J. Forbes (right tackle). >> The running back rotation looks to be Greg Bell then Maurice Washington. After that it switches up quite a bit. >> Oh, and the San Fransico Giants are coming to Lincoln?